Elderly adult games and activities can vary widely. Some seniors are more active than others, and there can be varied interests and abilities! But especially it can vary widely based on your definition of elderly adults! I actually researched it, and found that it totally depends on how it is defined at the moment. In some cases, elderly meant 50 and above! In others, 58, 65, 70, 80, etc. So, the games mentioned here are chosen because they'll work for all ages. From children thru to the oldest adult. In addition, they are fun, easy, and proven. Many of these ideas are also listed on our page devoted to senior birthdays! (defined on that page as 80 and above, but the same rules apply that it could be for any age!) On that page you’ll find these same game ideas, along with ideas for gifts and special party planning hints. Show a movie or classic TV show. Pick something that is funny or really entertaining (and a favorite depending on the ages of the senior citizens present). How about Red Skelton, Danny Kaye, Abbott and Costello, etc.? I personally love Bing Crosby, Kathryn Hepburn and Cary Grant. And of course Gene Kelly and Fred Astaire films appeal to all ages. Or how about some episodes of “I Love Lucy”? Have a sing-along! Try singing good old-fashioned songs that everyone will know. Have sheets with the lyrics printed for younger guests. Hymns and songs such as “Take Me Out to the Ball Game”, “The Animal Fair”, “The Band Played On” and other similar songs will be fun for everyone to sing! Bingo! For the elderly, consider having cards that have large print and markers that are easy to manipulate. If you are planning birthday party games for Elderly Adults, consider making the squares be something to relate to the honoree (rather than numbers). For example, make squares for their hobbies and interests - James Bond films, gardening, grandchild, etc. More info about creating your own Bingo games. Try some printable games for your next party. They may be just the thing you are looking for in elderly adult games and activities. Learn more and read our Printable Party Games Review. Create your own “Game Show” version of Jeopardy, using trivia from the decades, or play Trivia Games (especially those that can be played orally). Our decade timeline may give you some ideas. Games such as Checkers, Chess, Bridge, and Dominoes are enjoyed by all ages and ! Plan a This is Your Life Party. Can be a big job to plan, but still fun, especially as you watch it unfold! The payoff is priceless! 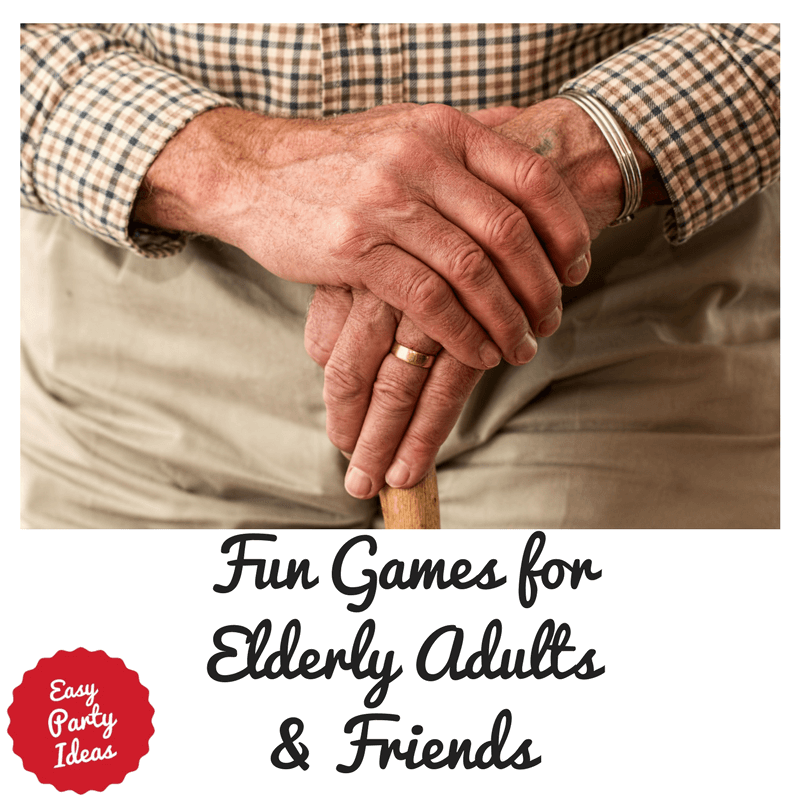 Have anything to our list of senior citizen party games and seniors activities? Please contact us and we’ll add it!